A red blur came shooting through the trees, wings clasped to it's sides to make it appear like a speeding bullet as it darted through the forest. The greenery rushed by at an incredible pace, his claws forced into his stomach by the wind he was creating and working against. A laugh escaped the crimson maw as the 'bullet' suddenly shot through the last lines of trees and into a meadow. The creature snapped it's wings open, grunting as pain shot up his bones, and touched down, slowing from a run to a stop in two or three seconds. When the creature lifted his head, he revealed himself to be a young FireWing, with sharp features and piercing gold eyes. Sweat poured down his brilliant red scales that shone like fire, the droplets on his face running down his snout to drip off at the tip of his chin. Panting, Aviur looked around, grinning foolishly like a hatchling. "HELL YEAH!" he suddenly exclaimed as he began to jump around. "I'm a speed machine, coming, going, can't be stopped!" he sang, before catching a glint of red out of the corners of his eyes. He turned his head, and his breathing hitched. Another dragon. She was.. stunning. Heat rose to his cheeks and Aviur was suddenly grateful his scales were so red. Taking a deep breath, he smiled at the female, waving with a flaming claw. A sudden yowl made Inferno snap to attention. She looked toward the source of the wretched sound, then scowled as another FireWing shot out of the surrounding forest and landed in the meadow. He’d emerged so quickly that it’d almost caught the female dragonet off guard. She wasn’t sure if he was someone friendly or malicious, either way would have warranted her same reaction to his presence. Judging by his joyful exclamations, Inferno could see that he was quite proud about something. With how fast he was traveling she guessed it was his speed. Though impressive, she couldn’t help but find his presence here to already be bothering her. He waved at her. She didn’t return the gesture. A testament to her current feelings about him. Inferno’s eyes narrowed as she looked him up and down. He wasn’t exactly bad looking, but that wasn’t something her mind could be fixated on at the moment. Right now, all she could think about was whether or not this other dragonet was here for the same reason she was. He had to have been. What other reason was there to come out to such a boring place? She snarled at him, baring her fangs threateningly. Aviur slowly stopped waving when she didn't return the gesture. Suddenly feeling awkward, Aviur cleared his throat and glanced around. The meadow wasn't too interesting, so what was she doing out here? Then again, the same could be said for Aviur. A light smirk sneaked onto his face at that thought, but then it faded as she looked him up and down. Very briefly, Aviur scanned her features. She had three gold rings around her horns and an armband with jewels embedded in its surface. Aviur's train of thought was broken when the dragon started to approach him. Aggressively. Aviur stepped back, getting into a fighting stance, something one of his new assistants taught him. He growled as she pressed her claw against his chest, his teeth bared at her arrogance and cold use of words. Deciding not to mention she was irritating him, he snapped at her. "Listen lady, I don't know anything about your damned treasure!" With a snarl, he grabbed her claw with his own and forced it off his chest as he backed away, hissing. Aviur had lived in the Rogue Lands almost all his life. He could fight. But the way the whites of his gold eyes shone as he looked st her, and the way his tail lashed about nervously, told anybody that Aviur was more frightened then aggressive. He dug his flaming claws into the earth, growling. His tail and wings pointed at the ground in a very unusual way, telling anybody he was about to something dangerous if she attacked. His eyes tracked her movements like a wolf tracked it's prey. Carefully and cautiously. When Aviur grabbed her claw and forced it away, Inferno’s instinct was to simply lunge at him. However, she found herself oddly unable to do so. For a second, she regarded him again. This time to see if he would perhaps be any threat to her. Judging by his muscle, that answer would be ‘no’. Inferno hadn’t a doubt in her mind that this dragon was mincemeat if he tried to tango with her. The only part of him that was remotely threatening was the flaming claws that were dug into the ground, singeing some of the grass that surrounded them. The stranger’s rather long tail was thrashing about, and he looked quite frightened by her. Inferno saw this as weakness, and simply scoffed in his direction, breathing out a small amount of embers from her nostrils. It was clear now that a fight didn’t need to take place. Inferno’s cocky smile melted a little as she tilted her head to the side. Eyeing the other dragon like he were a specimen of unknown origin. “If you’re not here for the treasure, then who in Pyrrhia are you? And most of all: what are you doing out here?” Her voice was stern and borderline accusatory. For all she knew, this dragon could have been some sort of traitor to the FireWing tribe. As if a last minute taunt, she blew a plume of smoke towards his face. "...and stop staring at me! I'm not your dinner." The sun continued to settle down into the horizon. Soon, darkness would envelop the meadow, which Inferno had momentarily forgotten was when she needed to find this hidden treasure. As Aviur backed away, he quickly scanned the female again. Clearly, he'd have no chance against her unless he transformed, which he did NOT want to do. He growled at her remark, eyes flashing dangerously. He watched her as she scoffed, his nostrils flaring at her attitude towards him. Did she not know who he was?! Wait. He hadn't been crowned yet. It was all a 'big secret' until Zaroc got back to him about the plans. He was a FireWing, so what?! A dull ache in the back of his mind reminded him of the fact that the IceWings would have never considered a WOLF HYBRID as their leader, let alone a teenage FireWing. He answered her questions with a flick of his tail. "The name's Aviur. And I was racing around, like a normal dragon," he said, gritting his teeth beneath his jaws. He glared as a puff of smoke entered his facial area, causing his eyes to water. Deciding to try and get a reaction out of her, which was probably a bad idea, he raised a brow and smirked. "What, I'm not allowed to stare at something pretty?" he flirted with her, grinning cheekily afterwards. Clearly, he was a childish dragon. Something he himself had figured out long ago. Folding his wings to his sides, as clearly a fight was not going to break out unless he pushed enough of her buttons, which was VERY likely to happen, Aviur asked HER a question this time. "So, whats it with this treasure anyway? I dont see anything." he asked with a tilt of the head and blink of the eyes, intrigue in his expression. What a stupid name for a dragon, complained the childish side of Inferno’s mind. Another part of her doubted the name would have bothered her had she not known the dragon behind it. As was the young dragoness’ habit, once she disliked someone, she tried her best to dislike most things about them. One part that didn't help her opinion of him was that he'd just complimented her. Her mind became almost instantly flustered. What's THAT supposed to mean! She thought, is he being sarcastic? Needless to say, the smug grin that followed soon after made her want to claw his eyes out. This time, her own talons dug into the ground, as if to restrain herself from attacking him. Meanwhile her cheeks felt much hotter than they usually were. Before she could say anything, he'd asked about the treasure she was seeking. She narrowed her eyes at him in distrust, but decided to tell him anyway. Besides, if he tried to take the treasure from her, she'd just beat him up until he gave it back. As Inferno spoke, the sun completely disappeared behind the horizon, and the moon peeked upward, big and brighter than most nights. Inferno looked back at Aviur, the excitement gone from her expression as though she'd snapped back into the realm of reality. “I got a headstart on my digging before sundown. So if you're gonna try and look for it, don't even think about going near my hole.” The dragonet pointed her claw to a mound of upturned dirt, next to it was a hole that was somewhat deep. At least, as deep as it could be after spending an hour digging with claws being her only tool. Inferno's sentence slowly drifted off as she noticed yellowish green dots flickering all around them. For a moment, the young dragoness thought it was some kind of magic. But she soon realized that it was merely lightning-bugs, coming to life and illuminating the meadow in a peaceful, vibrant lime hue. Combined with the bright moon, light danced off of the gold rings around Inferno's horn, adding another layer to the already beautiful light show. Her head raised and she looked around curiously. Does this have something to do with the treasure? Maybe there IS magic in this place. I’ve never seen such a large gathering of these glowing bugs. Aviur chuckled at her reaction to his comment on her appearance. He shrugged innocently, smirking devilishly. This is going to be fun, his inner voices echoed his thoughts quietly. At his question about the treasure, the dragoness narrowed her eyes, and Aviur raised a brow, assuming she didn't want to talk about it. When he opened his mouth to dismiss the question and change the subject however, she spoke, and Aviur closed his jaw. He tilted his head as he listened to her, eyes widening in interest and curiosity. When she seemed to forget she was there, the look on her face was rather appealing. Aviur saved the image of her face into his head. "Cool," he said, trying to act unexcited at the idea of hidden treasure. "So, like pirate treasure then?" he added, blinking slowly. She gestured to the mound nearby, and Aviur turned his head to look at it. He raised a brow. That's some dedication. He looked back at her as the dragoness introduced herself. "Infernoclaw? Cool name," He said, choosing to ignore her comment about him being a rabbit petter. As InfernoClaw spoke, she trailed off, and her eyes started wandering. Aviur raised a black eyeridge, and followed her gaze. His eyes widened as he made a full 360 turn, realizing there were lightning bugs in every direction. And the moon made it all the more cosy. Aviur grinned as InfernoClaw found a bug on her claw, and ****** quietly. Then, she torched the poor thing. "Indeed," he said, smirking lightly. As InfernoClaw looked around again, Aviur saved the images of her expression into his brain for later use. Damn..
Aviur shook his head and decided to offer his help. "Listen, I'm not really interested in the treasure itself, I just enjoy the feeling of finding cool stuff. So.. want help? With the digging?" the corner of his mouth twitched into a tiny half smile as his eyes brightened. "I won't steal it. Promise." Inferno visibly stiffened at Aviur’s offer to help her dig. Even though he said he didn't care about treasure or fortune, she wasn't exactly inclined to trust him just yet. However, per her previous assumption, it truly didn't matter if he wanted it or not. The treasure was hers, and she was more than willing to fight for it. Ultimately, two pairs of claws would likely be better than one. Even she had to admit that digging was getting to be annoyingly laborious. It wasn't so much the work that bothered her, but more how slow and boring it was. Upon closer inspection, it was apparent that the hole Inferno dug was more wide than it was deep. It was barely wide enough for a couple dragons, and deep enough that she and Aviur would need to climb into it to keep digging downward. Safe to say, it would be close quarters for the two of them, at least until the treasure was found. Inferno peered into the hole, then turned her attention toward Aviur again. Her eyes flicked up and down, quietly judging his stature. There was an odd feeling in her stomach, something she couldn’t quite shake. For a moment, she thought perhaps she was falling ill, but she’d shown no signs of sickness prior. The only way the female dragonet could describe it was the feeling of being excited even when there was truly no reason to be. Being crammed into a dirt hole next to another dragonet didn’t sound like the best way to spend an evening. Dismissing her inhibiting thoughts, Inferno leapt down the hole. She landed on her talons with a thud, then looked up at Aviur. Her amber eyes reflected the light of a few stray fireflies. At this point, she figured she should ask him to come down with her, and probably thank him for agreeing to help. Aviur raised a brow as he noticed Inferno tense visibly. He looked on as she considered, a flaming claw tapping lightly on the hard soil. He smirked as she huffed and agreed, before turning around. His smirk widened as she told him not to try anything. "Relax, Kitty, I won't," he chuckled, approaching the hole. He peered down into it and raised a brow. "Tight squeeze, don't ya think?" he mumbled, cocking an eyebrow as Inferno jumped into the hole. He opened his mouth to speak, but when she lifted her head to face him she made a moment that made him grin. He said nothing, just stepped back, and jumped in. Dirt sprayed everywhere as he slid down the side of it and into the space beside her, being sure to purposely 'accidentally' spray dirt into her face. Aviur smirked at her, before he started digging, using his claws to tear into the earth, with his wings occasionally slicing the dirt to help with the digging. As he dug, Aviur sneaked a glance at InfernoClaw, and decided to be.. cheeky. And funny, at least, it would be funny from HIS side. He grabbed a pawful of dirt and flung it at her, before grinning innocently. Aviur's nickname for her made her wince. Kitty? Was he calling her harmless? Inferno wasn't against nicknames, her own father had called her Fighter since she was a hatchling. This one was a little harder to swallow, however. Yeah... I'm a kitty alright. A vicious jungle cat!, the young dragoness assured herself. As Aviur slid into the hole, Inferno felt bits of dirt colliding with her face. She didn't look away in time to avoid any of it getting into her eyes, so she spent the next few seconds trying to rub the soil out of the corners of her teary orbs. Afterwards, she glared at him. Giving him a burning look of disdain. Despite what he'd just done, Inferno wrote it off as him being a clutz. So long as he didn't do it again, then perhaps he could be useful. The minute Aviur started digging, Inferno started as well. She grabbed as much dirt as she could, then threw it out of the hole. Repeating the process a few times before something truly unexpected happened. Having been a dragoness whose only friends were her dad and whatever trainers he'd introduced her to, she truly didn't grow up with others of her age. Regardless of how brash she seemed to be, she truly hadn't spent much time wrestling other dragonets since many of them didn't want to know her in the first place (and vice versa, she didn't want to be friendly with them). This meant that her experience in physical contact was limited. Now, as her tail brushed against Aviur's, it felt borderline electric. Uncomfortably foreign. Much like the feeling she was having in her stomach. It made her conflicted and all the more frustrated. At the moment she wished she'd made the hole wider so she didn't have to touch this smug dragon. Yet, another part of her was glad their scales made contact with one another, as she could investigate that strange churning in her stomach and hopefully make it go away. Just then, while lost in thought, a clump of dirt impacted and crumbled against Inferno’s neck. Her eyes widened, and her pondering was replaced by instinct and anger. In response to the dirt hitting her, she quickly turned to the young dragon and pushed his back against the side of the hole, pinning him there with her talon to his chest. She half-growled the next few words. In an instant, the raging dragoness’ back talons sunk down into the dirt they were standing in. It caught her off-guard, and she looked down in confused outrage. Before any more words could leave her maw, the bottom of the hole gave way and crumbled into what looked like an even deeper hole. Inferno gasped as she felt herself starting to drop. She tried to grab Aviur, but instead her claws just scraped against his chest and underbelly. In the blink of an eye, she was swallowed, falling roughly into the deep dark pit as her claws fruitlessly tried to climb upwards. The fact that the falling was lasting more than a couple of seconds told her that the bottom of this hole wasn’t going to be an easy landing. Especially since there wasn’t enough room to spread her wings and glide down easily. Aviur heard Inferno digging beside him and chuckled as he thought of their interactions that had just taken place. She was actually alright, for a Kitty. That was his new name for her. Kitty. Because she was legit like a cat! Hissy and short tempered and stubborn and.. fiesty. He liked a fiesty girl. The feeling of her tail brushing against his caused Aviur to very briefly pause in his digging. Lightning seemed to dance through his veins and set his brain ablaze. The sensation only lasted a second before it was gone. What was happening? There was a funny feeling in his stomach.. Something churning and boiling, like the magic inside his gut jsut before he released it to activate his Inferno Form. Except, this feeling was much HOTTER then the flames of his Inferno Form.. Much more.. electrifying. Aviur's train of thought was cut off when he suddenly found himself slamming into the wall, held by the chest to the dirt wall of the hold. He felt her hot breath against his face as she half-growled her threat at him. Then she stopped. Aviur felt the ground shift, and his eyes widened. "Oh crap." Then she was slipping. He felt her claws trying to find purchase on his scales, and on instinct he grabbed her claw with his own, but her wrist slipped out of his hold and she was gone. Eyes wide, Aviur thought fast. HE hadn't fallen because the spot where he was hadn't given way, thankfully. Panic and shock blocked the fear of darkness and being in cramped spaces on his own as Aviur jumped into the darkness. He released a small blast of fire, trying to illuminate the darkness around him. He saw Inferno and focused on her as the flame went out. "Inferno, hold on!" his voice cracked as sweat poured down his forehead. He outstetched his back legs and grabbed her, by which limb he wasn't sure, either a wing or a leg, and he had enough room to stretch his wings. Barely enough. Then the uneven weight slammed Aviur into the wall and he lost control, her limb slipping from his grasp. Cursing, Aviur did a last-minute move that could potentially kill him. Strapping his wings to his sides, he collided with Inferno as he dived beneath her and stretched his wings beneath her, letting her slam into his back so he would take the fall. He yelped as he felt a heavy weight come down on top of him and he closed his eyes, bracing himself for impact. Faster and faster with each passing second. Inferno looked down to see where this hole was taking her, but at that very moment she felt a rock crack against her forehead. Her talon instinctively went to the wound, and she could feel a bit of her own blood. Looking upward, she saw something that she hadn’t expected to see. It was Aviur...and he was actually trying to save her. The only thing more powerful than the feeling of relief that he didn’t just leave, was the determination of proving she didn’t need his help. Thinking as quick as she could, the dragonet pressed her talons onto either side of the pit, trying to slow her descent. This proved to be futile, however, as the dirt around her was far too loose. Not to mention every so often it felt like her claws were being struck and pressed back by bits of stone. Suddenly Inferno felt something clamp down onto the top of her wings. Looking up again, she saw Aviur had grabbed her with his back talons and stretched out his wings in an attempt to help slow her fall. She stared at him for a moment, stunned, dumbfounded that even as far down as they’d fallen he was still trying. She didn’t doubt that most other dragons would have likely given up on her by now. That was, of course, excluding her own father. The two had started to slow down, and Inferno reached up to secure herself on the other dragonet’s back talons. Before she could grab him, though, he seemed to lose control and slam into the side again. Inferno’s heart sank at the sight. Was there truly no way out of this? Was this how she was destined to die? Not as a warrior in the battlefield, or even as an elder in her sleep. Was she truly going to perish as a dragonet who dug in the wrong place? One thing was for sure, Aviur did not seem like he was going to give up anytime soon. Inferno’s eyes widened even more as he dove beneath her and spread his wings out. “What in the world are you-? !” Her body slammed down against his. She grunted and yelped before wrapping her front legs around his neck. “Are you crazy? !” She yelled over the wind that was rushing past them. “Don’t get yourself killed on my behalf! If we hit the bottom of this thing you’ll be dragonet soup!” She grimaced at that mental image. In all honesty, she hadn’t planned on herself fairing much better than him. This could very well have been their final moments...so at least they had that in common. Perhaps this was supposed to be the moment where she did the things she’d wanted to do before she died. Maybe kiss Aviur, so she could check ‘having her first kiss’ off of the list. Then immediately kill him, so she could check ‘killing her first dragon’ off as well. At the very least she might apologize for getting him into this mess in the first place. She opened her mouth, and once again, her words betrayed her. What is WRONG with me? She thought. For whatever reason, she felt like her choice of words had been extra strange lately. All of a sudden a blinding light engulfed them. For a moment Inferno thought they’d hit the ground and died. And yet, as her eyes adjusted, she realized that the light wasn’t death. It was an orb, as bright as the sun, shining over the ruins of what looked to be a city. Everything went silent as she and Aviur fell. At that moment, she realized that what they’d fallen down wasn’t a hole. The light beamed down, illuminating structures that were miles below them. All of which were cracked, crumbling and covered in what appeared to be moss. Despite the imperfections, the first word that came to Inferno’s mind was ‘Beautiful’. A majestic city located deep underground. How was such a thing possible? Surrounding the city, supposedly keeping the dirt from crushing it, was a dome made out of stone. Glancing back at where they’d fallen through, it was clear that some of the stone had been broken away. Inferno was glad that the tunnel had led them through the broken off piece of the dome, otherwise their drop would have come to an abrupt end. “-ry…” Inferno finished before wrapping her front legs around Aviur’s midsection and snapping her wings open. As Aviur didn’t feel that heavy to Inferno, the two of them quickly slowed to a stop, still miles above this vast city. Holding onto her questions about their location for later, she looked down at the dragon she was now holding as her wings flapped to keep them airborne. The fear was creeping up on him. Aviur felt panic beginning to seep through his veins. Go! his mind screamed. Leave her here! But Aviur ignored it. He HAD to save her. She was something better then him. Something better then.. Anything he had felt or seen before. He couldn't explain it. He valued her life over his and they hadn't even spent five minutes together. Her words stunned him, and Aviur tried to crane his neck to peer up at her. "At least I don't have to live with the guilt of letting somebody die!" Then, images of dragons entered his head. Zaroc, Artemise, Virgo, their smiles. Storm, Sparks, Atrex, him snatching the scroll of them. Sicarius, him and Aviur fighting, -that had been his first REAL fight- Snowflake, her nervousness. The dragons he had met? Only three of those he had gotten to know. Well, Artemise didn't like him, he knew that much. This isn't so bad, He thought as the wind picked up and they fell faster. My life hasn't COMPLETELY sucked. I didn't get a kiss though. A white light invaded his vision and Aviur shut his eyes. "I'm sorry too." For a moment or two, Aviur thought he was dead. Hopefully Inferno had lived and he had died, not the both of them. It would have sucked. Sucked more then him dying. But, the wind was still there, the weight on his back was still there. Opening his eyes, Aviur blinked, then his eyes adjusted surprisingly fast. What he saw, made his mouth drop open. A dazzling city, like nothing he'd ever seen, with a stone wall shielding it. Aviur forgot they had plenty of space to fly, and tensed when he felt somebody's forelegs around his stomach after Inferno finished her sentence. The sound of wings snapping open caused Aviur to look up and see Inferno. He grinned at her. "I'm fine! You?" he said cheerily through his pants. Stretching his wings beneath her, he gave them a few loose flaps, before nodding. "Yeah, I can fly. Let me go." When he felt her let him go, he dropped a metre or so, then extended his wings and flapped them, using the sudden change in wind pressure to go up and forward, spinning around to face Inferno. "That.. WAS AWESOME!" he shouted, grinning foolishly. "Did you see that? We just found the lost city o' gooold, baby! WOOO!" he exclaimed, doing barrel rolls around her and even doing a backflip around her, before spinning around to face her again. For me valiantly saving your life, I think you owe me a kiss," he smirked, and then he made kissy noises at her. Then, Aviur collapsed into laughter. After he'd finished laughing, Aviur grinned at her. Come on! Let's mooove, Kitten!" he then started diving towards the city. After hearing that Aviur was okay, Inferno gladly released him so that he could fly on is own. She would have carried him to the ground had his wings been hurt, but the dragoness was still glad she didn’t have to. “I’m okay, just...wow…” Inferno responded to him. Truth be told, her heart was racing. She’d gotten over the hurdle of fear and was now basking in the euphoria of simply being alive. Surviving such harrowing odds made her feel like she’d successfully cheated death. While normally she would have snapped at the other dragonet for behaving so childishly, she couldn’t bring herself to do it this time. Everything that he was doing and saying at this moment coincided with how she felt. Perhaps the only thing that made her snap out of her daze was when he mentioned they were in ‘the city of gold’. City of gold? Inferno thought. She looked to Aviur and cocked her head to the side, then proceeded to gaze over the old city. Looks like the city of stone to me. As he beckoned her then dove toward the city, Inferno started to follow him. She froze for a moment, however, when she saw something in the distance. It was hard to make out, but she could have sworn she saw another dragon in the distance. One with scales that were as black as ebony. Whoever it was they were simply standing there, watching the two dragonets enter the city. Inferno turned her head to call out to Aviur, but when she looked again, the dark dragon was gone. The young dragoness thought that perhaps she was simply seeing things. Shrugging the sighting off, she followed closely to the other dragonet. In moments, they’d both managed to land on a stone street. Inferno felt grateful to have solid ground beneath her claws, and she had to restrain herself from kissing it. Now that they’d landed safely, she swiveled her head from left to right, looking at the structures that surrounded them. Many of them looked like they were eaten away by time, while others seemed to clearly have been destroyed in some form of explosion. Was there a battle here? If there was, then it would appear that neither side won. It just occurred to Inferno that the city was surprisingly empty. However big it was, she hadn’t seen a single dragon aside from the one she thought she saw while they were flying. Despite its worn down appearance, the designs on the stone structures were quite intricate and pretty. She imagined that when they were new, they looked even better. The response Kitten gave him after he asked for a kiss was nearly enough to make Aviur start laughing again. As he dove towards the city, Aviur started spinning, deciding to have some fun since it was quite a long drop. He spun like a ballet dancer, stretching his wings slightly to prevent him from going too fast. As the ground approached, Aviur snapped open his wings and glided to the ground, claws making a soft 'clink' as they made contact with the stone. He gazed around, eyes widening at the complicate designs on the buildings around them. "This place must have been pretty beautiful when it was still inhabited," he said out loud, slowly walking forward. "Wonder who lived here," he added. He turned his head over his shoulder as Inferno spoke. And he smirked as he walked over to her. "Is that so?" Aviur waggled a brow. He then blew her a kiss, before grinning cheekily. "There ya go! Unless you want a REAL kiss?" he flirted relentlessly with her, giving her a devilish smirk as he craned his neck, peering at her out of the sides of his eyes. "At least I got the chance to say hi to something pretty," and then he was off, darting into the streets. Aviur was doing this purely for fun. He also wanted to see her reactions to his.. compliments. He liked her, he admitted that, but was he in LOVE with her? They had just met, so obviously he wasn't HEAD over HEELS over her.. he thought. Turning a corner, Aviur hummed to himself as he stretched his wings and flew to the roof of a building, and started leaping from rooftop to rooftop. "So uh.." he said as he jumped another roof. "How do we find this 'treasure?' I mean.. this place is pretty big, so.. do you have, like, a map or something? Any clues?" he questioned as he zig zagged over the street. Aviur slammed headfirst into the stone and fell to the ground, landing on his back with a gasp. He stared at the sky, the world spinning as his head screamed in agony. "Owww. F-" The next word he spoke is best not repeated. Aviur had blown her a kiss before responding to her remark. She furrowed her brow and frowned, looking utterly annoyed by his arrogance. There was something about this dragon that rubbed her the wrong way, and she wanted nothing more than to throttle him. Nevertheless, she was going to make it a point not to let him ruin this experience for her. How would you like a REAL claw to the neck? Inferno thought with a scowl. As Aviur took off, Inferno followed him. He flew upward and decided to jump from rooftop to rooftop. Rolling her eyes at this, the young dragoness chose to stick to walking the streets parallel to where he was going. When he asked about the treasure, Inferno’s eyes widened. She’d nearly forgotten about the treasure. If it was to be hidden anywhere, it had to have been in this city. Perhaps stowed away in a building, or locked in a vault. The mere thought of being closer to finding the rumored treasure sent a wave of excitement up Inferno’s spine. All of a sudden she felt something trickling down the side of her snout. She reached her claw up to wipe it away, but soon realized that it was blood. She felt the top of her head and remembered that on their way down her head had been struck by something. Since she’d all but forgotten about it until now, she didn’t feel it qualified as something that needed immediate attention. With a sigh, Inferno looked up at Aviur as he continued his jumping. So carefree, as though they’d just stumbled upon the world’s largest playground. Admittedly, the aspect of having an empty city all to themselves sounded like fun, but there was something off about this place. Where did everyone go? What happened to them? The other dragonet made another leap. This time, however, he looked distracted by something. Inferno saw where he was going before he did. She opened her mouth to warn him, but it was too late. Aviur collided with the side of the building and landed harshly onto his back, cursing to himself in pain.. The young dragoness stared at him for a moment before walking towards where he lay and sitting down. She grinned a little whilst looking over him, making sure there weren’t any signs of serious damage; something she doubted she would find. “Seamless, Avi,” she mocked with a chuckle. Her attention drew forward and she saw a peculiar building at the end of the street. It was mostly intact, and larger than some of the surrounding structures. Her eyes fixated on it, searching for any movement. Just as everything else here, there was nothing but the still, lifeless structure itself. Even so, something inside her said that they should investigate it. She looked back down at Aviur and grabbed his talon with hers. That electric feeling surged through her again, but she was able to ignore it for the time being. Instead she began pulling the other dragonet to try and help him stand back up. As the world finished spinning and came into focus, Aviur heard Inferno's voice, mocking him. Aviur rolled his eyes as he flipped quickly onto his stomach. He laid there for a few moments, trying to regain his breath, tail twitching on the ground as it lay flat behind him. He felt a claw grab and clutch his and lightning danced across his claw and into his foreleg, reaching his brain and making it buzz. 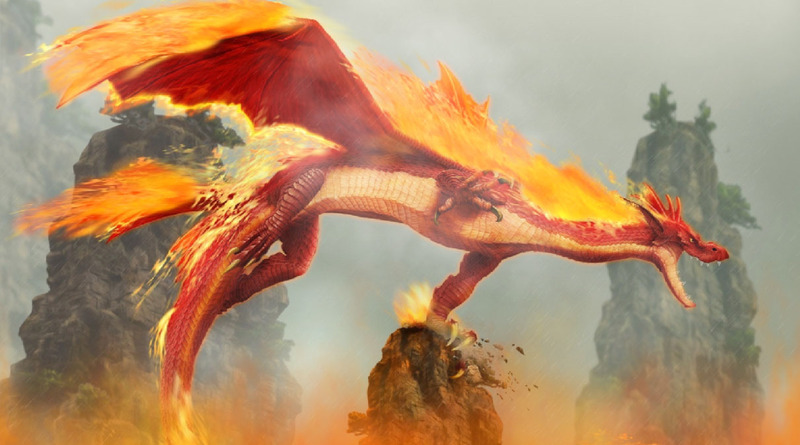 Aviur felt his face heat up as he looked up at Inferno, grateful that his crimson scales disguised his.. Emotions. Rising with Inferno's help, Aviur stumbled, but regainend his balance. Not noticing he hadn't let her claw go and was instead holding it gently on his own, Aviur raised a brow at her, grinning again. "I'm happy to entertain you, Kitty! he chuckled, not really bothered she was entertained by his pain. Well, a part of him was, but that was just his ego biting at the back of his head. Kitty mentioned a big building, and Aviur turned his head. Excitement filled his eyes when he laid eyes upon it. "Well, come on then!" He looked back at her, and then his eyes widened. Blood was trickling down Inferno's face. She must have hit her head when they were falling through the tunnel. Something stirred within Aviur. Something.. Funny. Something weird. He felt his chest tighten in a weird way, and his eyes widened. "I-Inferno your forehead, it's-" he stammered. "I-I'll see if I can find anything to clean the wound to stop any infection setting in." he said. Aviur glanced down, noticing his front claw was held in place, and he quickly let her claw go, awkwardly adverting his eyes. "There has to be something at the building," and then he was off, dashing towards the big building at the end of the street. There it was again. Her nickname. Inferno gritted her teeth as she fought not to say anything to him about it. Mostly because she knew he'd called her that enough times that she was destined to live with it. Still, something about his willingness to entertain her brought a smile to her face. Perhaps the first genuine one she'd given him since they'd met. It only grew wider as he enthused about exploring the building that she’d pointed out. As broad as it was, the smile was short lived. Aviur’s goofy grin dropped to one of seriousness, and with it, so did Inferno’s. This was an expression she thought he was incapable of. He looked at her in a way that she’d not really seen before. His eyes were filled with...was it concern? What in the world was he concerned about? Inferno’s mind connected the dots. He was just noticing the wound on her head. The fact that he was so concerned about it made her raise an eye. It wasn’t that bad...was it? She reached a talon up and wiped away more of the blood, soon realizing that despite it not hurting, the wound probably looked quite bad. Wait a minute. Is HE concerned about ME? The young dragoness thought. Pah! If anything I’M concerned for HIM! Of the two of us, he’s clearly the least likely to survive here! Before she could respond, he took off toward the building. Narrowing her eyes at him, she followed hastily behind, practically chasing him. He looked even more adamant about reaching the large structure now that there was a possibility for medical supplies. As the two dragonets approached the front of the building, Inferno took a moment to observe the outside of it. Being up close allowed her to see that the building wasn’t as pristine as she’d thought it was. Cracks and vines both grew along the walls, while the windows of the building had been either obliterated or removed. The threshold of the building was marked by two large doors that were already open to the outside world, one of them leaning a bit as its top hinge had been broken off. Inferno sauntered past the doors before finally turning her gaze forward. Not but a second later, she gasped and took a step back, startled by what she’d found. The doors were opened to a large hall. Light from the fake sun beamed through strategically placed windows near the ceiling, illuminating the room. Inside this hall were countless dragon skeletons. Many with old spears and swords lying next to them. Aviur caught her smile and saved that image into his mind. Was that her real smile? Something inside him told him it was. And it was.. The most beautiful thing he thought he'd ever seen. Aviur tilted his head, starting to smile himself, and then he saw the blood on her forehead. As the building grew larger Aviur could make out the cracks and vines covering it's once pristine surface, giving it the same war-torn appearance the other buildings had. Still though, as Aviur drew to a stop in front of the open doors, he suddenly didn't want to go in. This is a bad idea, he thought, and was about to suggest this to Inferno when she spoke. "It could get infected, Inferno! And I really don't want to have to ask Atrex to heal it," Aviur protested, tingles of fear going up his spine when he saw she was approaching the doors. Something unnerved him about this building. Didn't know what it was. Aviur didn't have long to wait. Inferno suddenly exclaimed his name, and Aviur dashed through the doors, forgetting his fear for a moment. And a loud crack came from beneath his front claw. A battle had taken place here. A number of dead dragons laid scattered about, their bones accompanied by spears and blades. Aviur knew what he had stepped on. Looking down, he saw a bone, now snapped, resting beneath his front claw. Hissing in shock, he quickly scrambled away from it and closer to Inferno, being careful not to step on anything else. "You think one side might have been after the treasure?" he whispered, suddenly afraid something might hear them. Like that thing he saw when he had been roof-jumping. A dark, ugly thought entered his head and Aviur took a deep breath. "Uh, Inferno?" he said, trying to be calm, and trying not to frighten his partner in-digging. "Maybe we should get out of here." Aviur caught movement out of the corner of his eye and grabbed Inferno's claw with his one out of reaction, snapping his head around to face the moving thing. He saw nothing, but for a moment, he thought he had seen a pair of silver eyes..
Aviur was breathing heavily now, not taking his eyes off the shadowy areas of the building. They were being watched. They had to be. Inferno’s ear twitched when she heard the snapping noise of Aviur’s talon against the brittle bone. She looked toward it, then looked at him as he scrambled closer to her. The bone didn’t quite bother her as much as it probably should have. The room full of dead dragons was infinitely more spine-tingling. Aviur had a point, a battle certainly seemed to have taken place here. Between who, though? And for what purpose? Could it truly have been for the artifact they were searching for? Fighting over treasure, of course, was common among dragons. Inferno had seen many FireWings fight for various valuable objects. Although, she couldn’t say that she’d seen groups of dragons fighting and killing for anything other than land or vengeance. The thought of actually ending another dragon’s life to possess an object seemed...extreme. For a moment, practically miliseconds, Inferno pictured what she’d do if the treasure turned out to be the weapon she oh-so-badly wanted. She asked herself what she would do if Aviur tried to claim it for himself. Would she kill him for it? The answer, without hesitation or a second thought, was ‘no.’ She wouldn’t kill Aviur, even if he tried to kill her for it. No dragon’s life was worth any kind of material possession. Even if she didn’t kill him, however, she’d be more than willing to beat him up. In fact, she’d been wanting to beat him up since they first met. Perhaps once they were in a safe area again, she’d do it just to get it out of her system. Thoughts of hurting the other dragonet only increased as he looked utterly spooked by something. He’d suggested that they leave, but Inferno merely scoffed. She was about to take a step forward when she realized that their talons were, once again, clasped together. Instead of paying too much attention to it this time, she simply pulled her talon away. “Oh stop being such a rabbit-petter, it’s not like these dragons are gonna rise from the dead to attack you…” she paused, pretending to look scared. “...or are they? I think I can hear them talking! They’re saying ‘Aviur, come join us in the land of the dead. We want to eat your flesh~’” the young dragoness mocked. She stepped forward with an amused grin. As she walked, Inferno brushed various bones out of her way and eyed each weapon that she passed. Not a single one of them looked special by any standard. It didn’t seem like the treasure was here, at least, not among these dead dragons. Immediately after Inferno’s sentence ended, a loud thump could be heard coming from a room on the other side of the hall. Following soon after was a blood-curdling cry. It was so loud, it made the FireWing dragoness snap to attention and look to where the noise was coming from. The shout sounded undeniably like a male dragon in pain. Inferno looked to Aviur for a brief moment before facing forward and darting off toward the sound. As she entered the room, the young dragoness’ eyes widened as she saw another dragon. For a moment she thought it was the same one she saw upon entering the city, however, this one’s scales were red while the other ones were black. “No! Stay back!” the strange FireWing exclaimed, breathing out a plume of fire. The flames illuminated the room a little more, and Inferno saw that one of his wings was trapped underneath debris that had collapsed from the ceiling. Stone Haven, Inferno mentally noted, so THAT’S what this place is called. Aviur's visage became one of anger and frustration as InfernoClaw dismissed his fearful words. "Haha," he muttered, eyeing the bony corpses with slightly more wariness then before. "You know.. my dad, or at least he was kinda my dad, once brought me to a funeral?" He stepped over a bone carefully. "And he and his mate accidentally left me in the room all day with the corpse." He prayed this would explain his wariness or skeletons and just general corpses. "And that's how I got two things. One, the fear of skeletons, and two, the tendency to wet the bed for months," he rambled. Then, he glared at her, guessing what she was thinking. "I was five, this wasn't recent." When Inferno suggested they leave, Aviur tried to resist the urge to jump for joy. "Yeah, let's go-" as he turned to leave, a loud thump entered his ears. Eyes widening, Aviur whirled around like a tornado, frozen to the spot immediately after. Then a scream that sent his red-hot blood dropping a few degrees. He met Inferno's eyes, and then she was gone. "Wha- Inferno! Are you mad?!" he exclaimed. For a few moments, he was torn, and he glanced from the door to where she had gone a few times. He then looked to his right and saw the accusing eyes of a skull glaring at him. Aviur shivered, then darted after her. He heard a shout, and accelerated to an even faster pace. As he skidded into the room, Aviur unsheathed his claws, and they glowed a gleaming red as the flames danced in the wind he created. What laid before him was.. shocking, to say the least. It was not one of those weirdo black dragons he'd seen, no, this was.. a FireWing? He LOOKED like one, what with the red scales and all, -and Aviur thought he'd heard the crackling of flames coming from here, or had that been Infenro?- But he couldn't be sure. Aviur raised a brow, and his almost fearful expression hardened. He strode towards the weakened dragon and glowered. "Could be asking you the same thing. Now, before things get rough for you, tell me,what is this hellhole called Stone Haven, and why are there goddamned corpses littering that goddamned hall?!" he demanded, gesturing over his shoulder towards the hall with his front claw. "And who the hell's Temur!" Aviur raised his claw and held it threateningly over the dragon's throat, showing he wasn't about to show mercy or take any crap. "Straight answers." Inferno opened her mouth to prod more about Stone Haven, but before she could say anything Aviur marched past her. His claws were aglow with fire, and he looked concerned yet aggressive. Something that she couldn’t deny admiration for. He’d even managed to ask all the questions that came to her mind. When he held up a claw to the injured dragon’s throat, Inferno caught herself grinning. Something about seeing this side of Aviur was pleasing. Especially after noticing how scared he was prior. The trapped FireWing gulped and widened his eyes as Aviur’s claw came too close for comfort. He proceeded to speak hastily, like his life depended on getting his answer out as fast as dragonly possible. He looked down slightly, his expression saddened. He nodded his head then recovered and looked into Aviur’s eyes. The dragon’s eyes flicked to the door, then to Inferno, then back to Aviur. EbonWing, Inferno thought, those dragons have dark scales, right? Could that have been the dragon I saw earlier? Cor visibly winced as the female dragonet insulted him, looking at her somewhat spitefully. The aching of his wing, however, was a painful reminder that he didn’t have the luxury to be offended at the moment.